The Cinque Terre is a rugged portion of coast in the Liguria region of Italy, to the west of the city of La Spezia, which goes from Point Monternero and Point Mesco and includes the five villages of Monterosso al Mare, Vernazza, Corniglia, Manarola, and Riomaggiore. Thanks to its characteristic geographical location Le Cinque Terre is one of the most attractive tourist destinations of the La Spezia Riviera and in general of Liguria county. The distinctive natural landscape which include these villages with its hilly and harsh features are softened by the cultivated terraces, built over the centuries, that flow steeply towards the sea, providing the most dramatic and fascinating scenery of Liguria. The coastline, the five villages, and the surrounding hillsides are all part of the Cinque Terre National Park and is a UNESCO World Heritage Site from 1997. In 1998, the Italian Ministry for the Environment set up the Protected natural marine area Cinque Terre to protect the natural environment and to promote socio-economical development compatible with the natural landscape of the area. In 1999 the Parco Nazionale delle Cinque Terre was set up to conserve the ecological balance, protect the landscape, and safeguard the anthropological values of the location. The “Via dell’Amore” “Lovers’street” is the tourist pathway connecting Riomaggiore to Manarola and represents one of the best known of Italy. Anyone visiting the Cinque Terre wish to walk amongst the colourful houses of Riomaggiore ( you can reach the village from La Spezia following the directions for Portovenere and after for Cinque Terre) reaching finally Manarola. After the end of the works for the railway the powder-magazine was destroyed but the two paths didn’t follow the same destiny and the inhabitants of the two villages understood soon the usefulness to connect with a short and accessible the two villages. Two inhabitants of the area, who had been promised a very large amount of money for that time 10,000 Lira, took it upon themselves to modify the two paths in order to make them more accessible. The beauty of the landscape and the mildness of the climate make this itinerary one of the most visited both in summer and in winter season, it is easy to reach from Riomaggiore Railway station and it has lots of banks along the way from where you can enjoy the magnificent panorama. You can stop in the village and enjoy a meal of fish in the typical restaurants of Manarola or Riomaggiore. In summer time it is the best access for cliff diving. 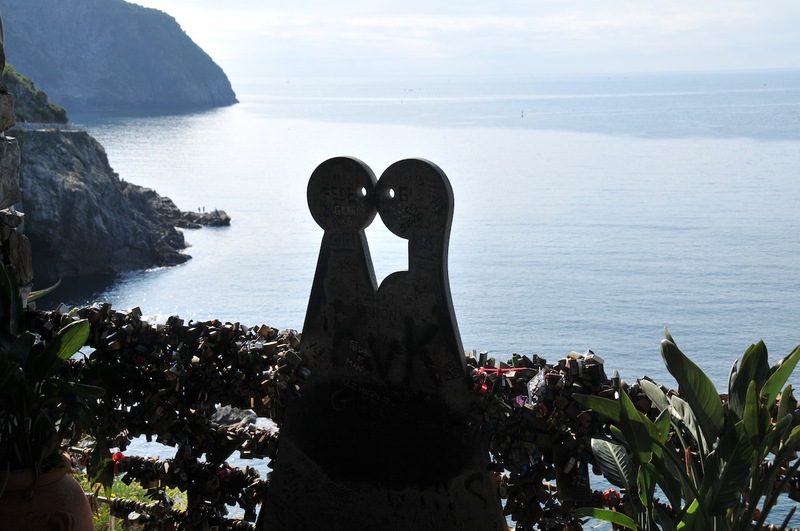 How to reach La Via dell’Amore- it is easy to reach from Riomaggiore Railway station. When you get there you will see the steps which will allow you to cross the railway and to reach in a few minutes the entrance of the famous trail. The Via Dell’Amore is accessible with the Cinque Terre card (which can be purchased at most of the tourist information centers in each of the five villages) and in twenty minutes you will get to Manarola.